Montreal, Canada: April 11, 2019 – TelcoBridges, the leading designer and manufacturer of carrier-grade FreeSBC virtual session border controllers and Tmedia VoIP gateways, today announced that the innovative and disruptive FreeSBC offering has now surpassed 10 million session-downloads from hundreds of different customers in 91 countries around the globe. FreeSBC is commercial software that provides Service Providers with an ideal opportunity to implement a long-desired shift in their spending models. FreeSBC addresses a gap in the SBC marketplace by providing agile service providers with a CAPEX-free alternative to diversify their supplier base and more-nimbly adopt best-of-breed SBC solutions. The platform-agnostic FreeSBC is available for free download on any combination of VMware™, KVM/OpenStack™, Amazon/AWS ™ and bare metal servers as well as dedicated network devices as part of virtual network function integration. FreeSBC is widely interoperable with major software solutions and carrier networks, finding use cases both in the core and the edge of networks. 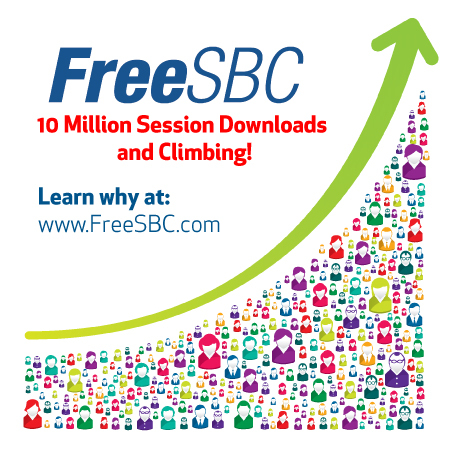 FreeSBC easily scales, supporting anywhere from 100 to 60,000 sessions per server, with support for 1,100 completed sessions per second (CSPS) and up to 6,000 session attempts per second (SAPS). To learn more about the FreeSBC offering visit freesbc.com or contact us at sales@telcobridges.com. TelcoBridges’ FreeSBC virtual session border controller protects networks from DoS and DDoS attacks while offering outstanding session handling performance. FreeSBC runs on any combination of VMware, KVM/OpenStack, Amazon/AWS and bare metal servers as well as dedicated network devices as part of virtual network function integration. FreeSBC is offered via a “freemium” business model, where the basic FREE-edition can be licensed to end-users at no cost, while the optional PRO-edition adds additional features and live support for a $1/session/year subscription. To date, more than 10 million sessions have been downloaded by hundreds of customers in 91 countries around the globe. TelcoBridges is a leader in the design and manufacture of carrier grade, high performance, and high-density SBCs and VoIP gateways. Based in Montreal with offices in Poland, Turkey and Hong Kong, TelcoBridges has deployed VoIP solutions in more than 100 countries worldwide. TelcoBridges' brands include: FreeSBC™, Tmedia™ (VoIP media gateways), Tsig™ (signaling gateways), Tdev™ (development platforms) and Tmonitor™ (real-time network monitoring equipment). For more information, visit www.freesbc.com or telcobridges.com.